CD-writer.com Ltd is the UKs leading supplier of digital media production and workflow solutions for individuals, digital agencies, educations, governement bodies and business of all sizes. We provide our customers an easy to use method for choosing from a wide variety of CD, DVD, Blu-Ray and Flash Media duplication, publishing and printing solutions. We ship products within the UK, across Europe and WorldWide. Before making a larger or more expensive purchase it might be wise to check availability or shipping times. Customers purchasing product combinations might like to call us to see if they are entitled to further discounts, which will be prepared as a written quotation. CD-writer.com Ltd (incorporated in 1999) quickly forged a market niche and are now regarded as the UK's leading supplier of CD, DVD Blu-Ray and Flash media production systems. Since we specialise in duplicators, printers and publishers we can offer you a wide choice of products and flexible prices. Rather than offering you products from a single manufacturer we can tailor a solution to meet your exact production and budget requirments. Ask us for a quote on any hardware products you need. We are also in the position to offer great volume discounts and trade incentives. If you think you need two duplicators or want to supply a friend or customer then ask us for reseller prices. With a reputation built on service, value and great products CD-writer.com Ltd supplies many blue chip companies, financial institutions, government bodies and educational authorities. An extensive range of CD DVD duplicators, copiers and printers are on offer with systems from leading manufacturers including StorDigital, Microboards, Primera, Rimage, and MFdigital. CD-writer.com Ltd also offer their own brand of professional StorDigital duplication systems including; high capacity robotic auto copiers and manually operated high capacity tower copiers. CD-writer.com has been trading online since 1998. CD-writer.com Ltd was founded by professionals from the CD and DVD design, creation and production industries. We always take our customers needs seriously and work constantly to improve the products and services we offer. 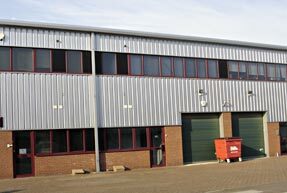 Our London facility is located at 15 Greenwich Center Business Park, 53 Norman Road, Greenwich, London, SE10 9QF from where we operate our warehouse, shipping, sales and marketing. Visitors by appointment. Our most recent xxhibition was at Broadcast Production Show, where we demonstrated product from the StorDigital DVD Duplicator range. 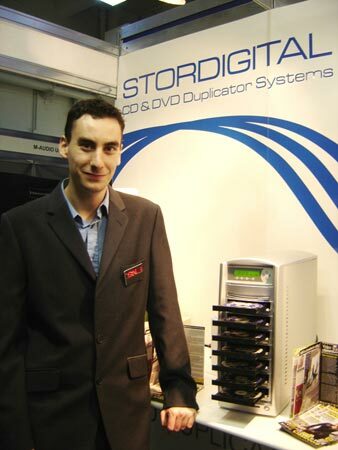 Most popular was the SD1000 Robotic DVD Duplicator, offering unattended duplication of up to 1000 discs over 8 drives. The show was a big success for CD-writer.com Ltd, and our products receieved a good response. It's always nice to meet our customers face to face to get feedback and to allow us to better understand your needs. BETT Edutactional Technology Show, Olympia London. BETT is the world's leading educational ICT event, attracting over 600 educational suppliers and 27000 visitors, and bringing together the global teaching. CD-writer.com Ltd exhibited a range of products including the MicroBoards Print Factory 2, StorDigital Robocopiers, StorDigital Tower Copiers, Thermal CD DVD Printers and more. Find out how an in-house DVD CD duplication, copying or publishing solution can help your enterprise or organisation. The latest additions to the range are the StorDigital Robocopiers, offering disc input capacities from 100 to 1000 and recording capacities of up to 7 CD or DVD recorders. StorDigital RoboCopiers offer standard and enhanced configuration to offer an optimum balance between speed and quality. No other automated CD and DVD duplicators can out-perform StorDigital RoboCopiers on a "Burn for Buck" basis. By offering highend robust automated solutions at an entry level price, StorDigital Systems are making unattended CD and DVD production accessible to everyone. The CD-writer.com product range does not end with hardware. They offer a huge range of CD and DVD consumables including media, cases, labels, inks and accesories. We can supply discounted ink bundles for all the leading CD and DVD printers, including Primera Bravo and Microboards Print Factory. If you need any advice about how to achieve the maximum return on your investment, or if you wish to gain a greater understanding of the different CD and DVD production processes, Call us today on +44 (0) 208 293 0777. We demonstrated our range of duplicators including StorDigital Products, Microboards Printers, MF Digital Automated systems and new products including BAXTER. Follow the link for more info and some great pictures. See pictures of the Broadcast Production Show here. Shopping @ CD-writer.com is totally secure! Like most of todays online shopping websites we offer our customers a secure shopping transaction. This means that when you have added your goods to your cart, and filled in your address information you will be transferred to the WorldPay secure server in order to enter your credit card details. You will be aware that you are visiting a secure website because a GOLD PADLOCK will be displayed at the bottom of your browser. If you are using Internet Explorer and you don't see the GOLD PADLOCK on the page you are asked to enter your card details, please select the VIEW option from your browser toolbar and ensure there is a tick next to STATUS BAR. Where is CD-writer.com Ltd located ? We are based in the heart of Historic Greenwich. Our London offices are located within the Greenwich Commercial Center, from where we ship our products direct to businesses across the United Kingdom and Europe. See our contact details here. Because we specialise in CD and DVD Duplicators you can be assured that you will buy the right product at the best price. If you are unsure about the best product for your needs we will provide you free and impartial advice. We are independant. We work closely with a number of key manufactuers and distributors, including, Primera, Rimage, and Microboards to ensure our products and prices are always up to date and you recieve any necessary aftersales support. There are several ways to order at CD-writer.com. You can order online, via the telephone, via fax, via email, purchase order or in person. First time orders, from non-account holders, will be shipped only on receipt of a credit card payment or other cleared funds. Account application terms available on request. Purchase orders will be accepted by all government bodies and educational authorities. Overseas orders may be subject to checks beyond those required by the online checkout process. Online ordering at CD-writer.com is made secure via Worldpay. If you have any queries please contact us here. We accept payment via the following methods Online via the website using a credit or debit card, over the telephone using credit or debit cards. Money transfer via your local bank. Online money transfer via internet banking. Or by cheque. Cash payments can and must be made when collecting goods from our premises. If you have any queries please contact us here. Deliveries from CD-writer.com Ltd are made via courier or Royal Mail postal services. The shop will calculate the amount of shipping to be paid based on weight. We usually ship up to 10Kgs for around £7. Our minimum charge for a courier delivery is £5.50. Lighter items will ship with Royal Mail. If you have any queries please contact us here. We also offer qualifying customers account status. If you want to get apply for a trade account with us please register here. Customers should note that a trade account does not mean we will offer you a credit account. CD-writer.com Ltd actively encourages business relationships We understand that being part of a supportive business network can be very beneficial. As a strategic partner CD-writer.com Ltd couldn't offer more. We are a well established web based retailer that has a strong niche user and customer base. We've been retailing online for over 12 years and have been actively involved in the development of interactive media technology for over 16 years. We understand that being part of a supportive business network can be very beneficial. If you have a new business idea, new products or a web site to promote we will be glad to hear from you.